HOLA tutor Nancy Roberts helps out Maria Leonello complete an exercise on English capitalization at the HOLA GED tutoring in Painesville, Oh. The key hurdle is the educational requirement of the deferred action program. Immigrants must be enrolled in school, graduated from high school or have served in the military, and if they haven’t, they’ll need to get a GED, the equivalent of a high school degree, or enroll in an education, literacy, or career training program. 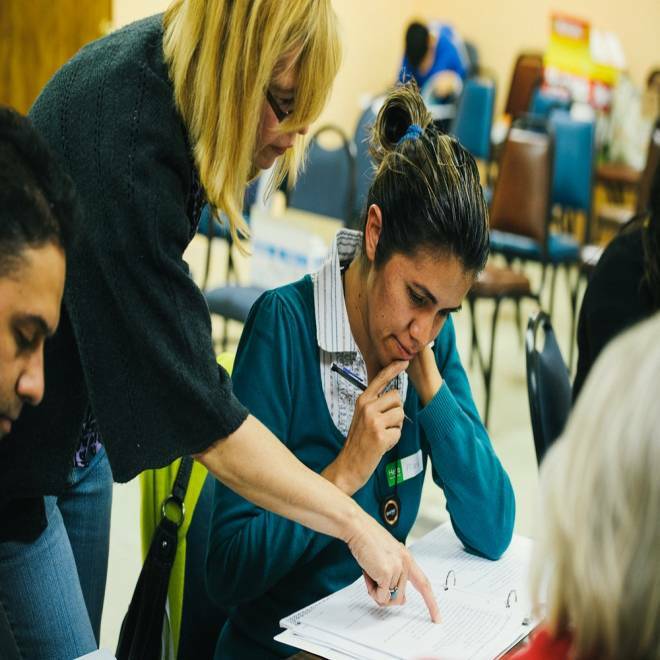 Some of those trying the GED route are hitting roadblocks. Gabriela de Jesus Diaz Bocardo, a 23-year-old immigrant from Mexico living in Phoenix, Ariz., is one of them. She has spent two months trying to find a prep class she could afford since a state law effectively prohibits undocumented immigrants from taking the free courses. One school told her a one-year program would cost her $4,000, which was way beyond her means. As Diaz and others have learned, merely getting into a GED prep course -- let alone taking the test -- won’t be easy: Adult education serves about 2 million people nationwide though nearly 35 million don’t have a high school diploma or its equivalent. This is mostly because the availability of services can’t meet the demand, the Department of Education said in a statement. Some 72 percent of adult education programs had waiting lists in 2010, according to a national survey by the National Council of State Directors for Adult Education. Between 320,000 and 350,000 of the 1.7 million undocumented immigrants who are potentially eligible for deferred action are impacted by the education requirement, according to estimates from the Migration Policy Institute and the Pew Hispanic Center. They are 16 and older and do not have a high school diploma or GED, and are not currently enrolled in school. Overall, the government had received some 180,000 applications for deferred action as of Oct. 12, with nearly 4,600 of them approved, according to the latest data. 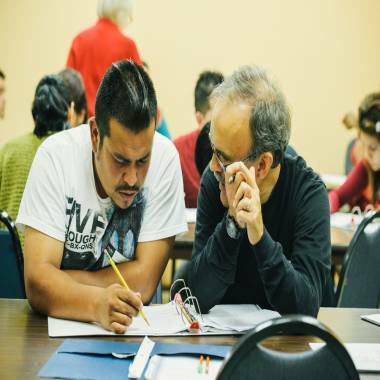 Ricardo Zopez works with HOLA tutor Alan Brown on math problems during the HOLA GED classes in Painesville, Oh. Some take exception to undocumented immigrants accessing such programs. Others feel it is unfair to set a requirement for some in the group that could be insurmountable. The GED consists of five tests covering math, reading, science, language arts and social studies. It takes about seven hours to complete. Some GED state testing centers are seeing a spike in requests to take the test or a course, as well as an uptick in calls with questions about the exam since the government began accepting applications for the deferred action program on Aug. 15, according to an informal survey of state GED test program administrators conducted by the GED Testing Service, the official creator of the exam. In Iowa, centers have experienced a 20 percent rise in English as a Second Language attendance for GED prep, while Massachusetts has seen a 25 percent to 50 percent surge in registration for the test through Spanish. In North Carolina, there has been a 5 percent to 10 percent increase in testing requests, including to take it in Spanish, prompting adminstrators to order more such tests for next year. McLendon, who reviewed the GED Testing Service survey and conducted his own of state directors, said it’s been “a mixed bag” so far. In Painesville, a community of 18,000 outside Cleveland, an immigrant rights’ group knew the educational requirements would be a problem for those youth who were not the undocumented college graduates often seen leading the campaign for getting legal status. 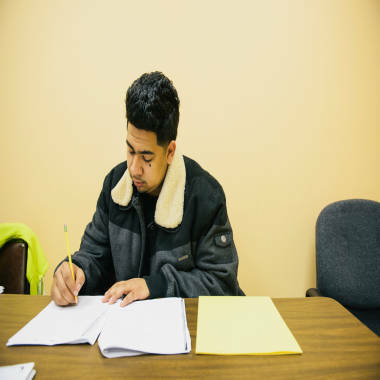 Juan Maldonado works on the math section of a GED practice worksheet in Ohio. Dahlberg contacted the local Adult Basic and Literary Education (ABLE) program, which told them they’d be happy to partner but had already allocated their annual budget. So HOLA began a fundraising drive, which included raffling off a car donated by a local pastor. The group raised about $6,000 to pay for two ABLE teachers and four tutors, some of whom are bilingual. On Sept. 10, they began with eight students in makeshift classrooms in the HOLA center. Today, they have 29. Some students are proficient in English and completed a lot of school, but a majority will have to take the test in Spanish. “I never thought this would be as big as it’s become. It’s really great that the students … want to learn, want to do better, want to get a better job,” said Carol Darr, ABLE coordinator in Painesville. Juan Maldonado, 20, and the oldest of six brothers who dropped out of high school after his dad was deported to Mexico two years ago, said many of the students were excited about having another option to get their diploma. “You feel like now there are no limits to what you can do,” he said. Maldonado, who likes math but has trouble with grammar, said returning to school has taken on a whole different meaning since his first go-around.